Staff Sergeant Arthur E. Wedemeyer Jr., 1930-2000. A veteran of the U.S. Marine Corps, Tiburon Naval Net Depot FD, Treasure Island FD, and Larkspur FD. Arthur E. Wedemeyer., Jr., nicknamed "Bud". by Tom Forster, with thanks to contributions from Arthur E. Wedemeyer, III and the Wedemeyer family. Arthur E. Wedemeyer, Jr. was born to Arthur E. Wedemeyer Sr. and Eleanore Thomas Wedemeyer on May 28, 1930, in Santa Monica, California. At the time AEW, Sr. was a stunt pilot based at Clover Field in Santa Monica. The family eventually moved to Northern California and settled in Larkspur in the early 1940's. AEW, Sr. would be elected to serve three terms on the Larkspur City Council, and was the Mayor at one point. He also helped start the Larkspur Planning Commission, and served as it's Chairman. A successful businessman, he made the family living operating a business from 1942-1949 in downtown Larkspur called Florence’s Sweet Shop, where they served breakfast, lunch, and ice cream. ​His other business connections in Marin included a service station in San Anselmo, Culpepper Real Estate in Larkspur, and Borden's Dairy Delivery Company. 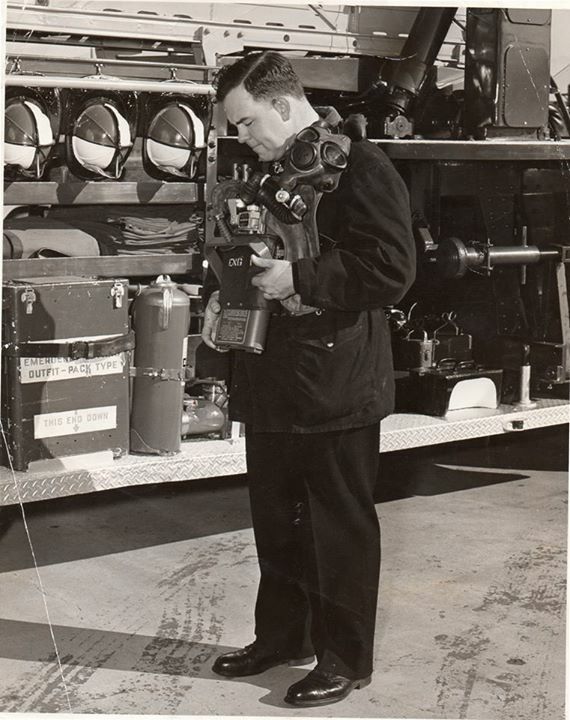 He was also a filmmaker by hobby, and shot the tragic Mar Vista Motors fire footage on 4th St. in San Rafael that can be viewed in our Major Fires section. He resigned as Mayor in 1951, and moved to Ukiah after purchasing a beverage business. ​AEW, Sr. was very active in the Larkspur Lions Club, served as President, and helped found and operate the community event called "49'er Days." This very popular event was held over a four-day period each year as a fund-raiser for the Lions Club and their charitable activities. 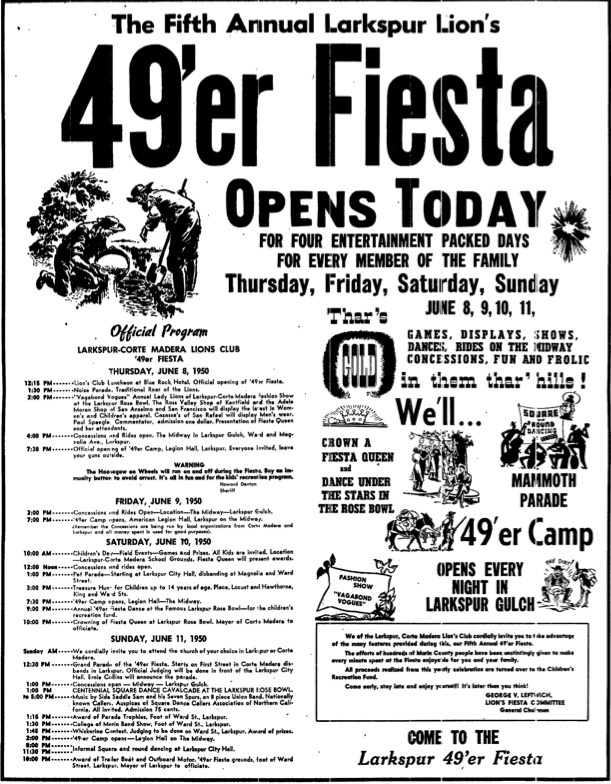 The theme was the Gold Rush and the "49'ers", and it included a parade, dancing, kid's events, faux gun battles, and the crowning of a Fiesta Queen. Arthur E. Wedemeyer Jr. (Bud) joined the Larkspur Volunteer FD at 18 years old. His nickname was “Bud”, after his favorite Uncle Buster, or Bus, whose name a very young AEW, Jr. could not pronounce. He would instead say “…me Bud too….”, leading to his nickname. Bud enlisted in the United States Marine Corps Reserves at the Log Cabin in San Anselmo, California in February of 1949. At the age of nineteen, Bud went to the Marine Corps Reserves meetings held in a Quonset hut at the College of Marin. He went on active duty in 1950 after turning twenty, and was assigned to George Company, 3rd Battalion, 5th Marines, 1st Marine Division at Camp Pendleton. When the Korean War started on June 25, 1950, Art was on leave fishing at Lake Pillsbury in Lake County. When he got back home to Larkspur, his father said “… where the hell were you! ?” Art asked him why, and his father replied that a war had started in a place called Korea, and that he was ordered to report back to Camp Pendleton. “I had to send out the Mendocino Sheriff’s Department looking for you…” said Art Sr.
After reporting back to Camp Pendleton, he was flown to Japan and was assigned to L411, a 105mm Howitzer battery, and was tasked to a security squad. Bud entered the Korean War in September 1950, making the landing at Inchon, then participated in the fighting for and retaking of Seoul, South Korea. He then landed at Wonsan and marched to the Chosin Reservoir in North Korea. 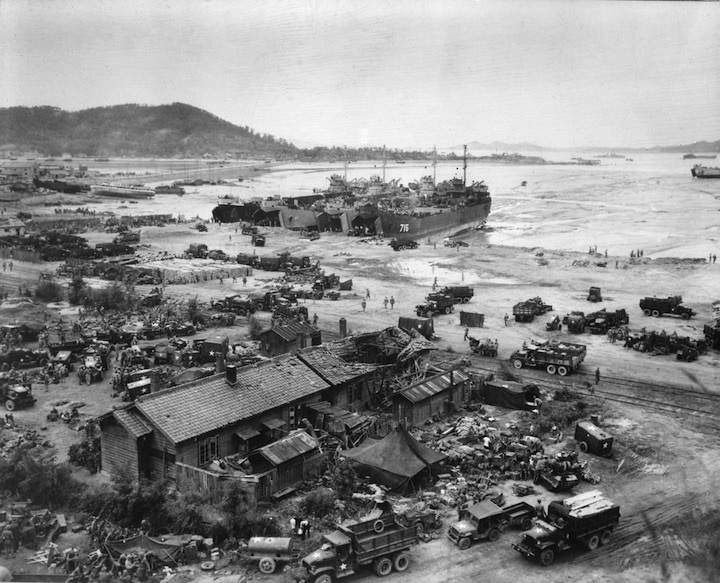 By this time, after the successful landing at Inchon by the US X Corps forces, and the subsequent destruction of the Korean People's Army, the Korean War appeared to be all but over. United Nations (U.N.) forces had advanced rapidly into North Korea, with the intention of reuniting North and South Korea before the end of 1950. On October 25, 1950, with General Douglas MacArthur's United Nations forces closing in, Communist Chinese forces began coming across the border. Surprised by the Marine landing at Wonsan, China's Chairman Mao Zedong called for the immediate destruction of the various enemy forces in a telegraph to Commander Song Shi-Lun of the PVA 9th Army on October 31. Under Mao's urgent orders, the Chinese 9th Army was rushed into North Korea on 10 November, undetected by UN intelligence. Striking the spread out U.N. troops with overwhelming force, the joint forces were forced to retreat all across the front. In northeastern Korea, the U.S. X Corps, led by Major General Ned Almond, was strung out with its units unable to support each other. Those units near the Chosin Reservoir included the 1st Marine Division with Bud Wedemeyer, and elements of the 7th Infantry Division. Chosin Reservoir is a man-made lake located in the northeast of the Korean peninsula. Chosin is the Japanese translation of the Korean word Changjin. 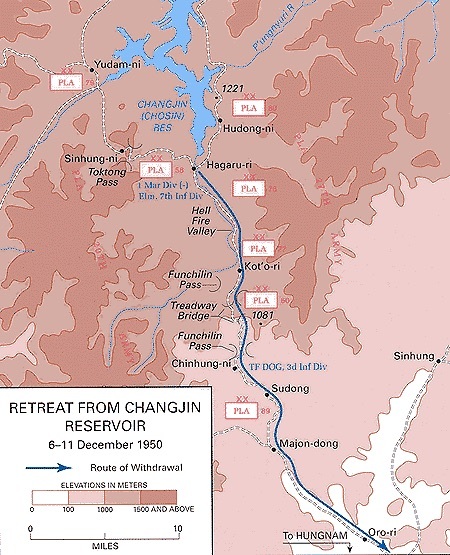 This start of this battle, also known as the Chosin Reservoir Campaign or the Changjin Lake Campaign, was a surprise to the U.S. and U.N. forces gathered there. The Battle of Chosin Reservoir is taught today to all Marine recruits at boot camp, along with Belleau Wood and Iwo Jima, as one of the seminal battles in the Marine Corps’ proud history. On November 14th, a cold front from Siberia had descended over the Chosin Reservoir, and the temperature plunged to as low as −35 °F, and with wind chill factors often felt much colder. Meanwhile the Chinese 9th Army quietly entered the Chosin Reservoir area on November 17th. 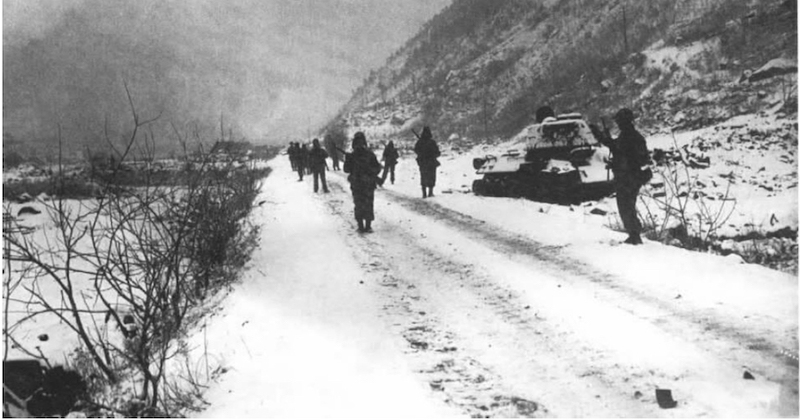 The battle's main focus was around the 78 miles (126 km) long road that connects Hungnam and Chosin Reservoir, which served as the only retreat route for the U.N. forces. Through these roads, Yudami-ni and Sinhung-ni, located at the west and east side of the reservoir respectively, are connected at Hagaru-ri. From there, the road passes through Koto-ri and eventually leads to the port of Hungnam. The area around the Chosin Reservoir was sparsely populated. Advancing quickly, the Ninth Army Group of the People's Liberation Army (PLA) blunted the X Corps advance and swarmed around the Marine Corps and U.N. troops at Chosin. Alerted to their predicament, General Almond ordered the commander of the 1st Marine Division, Major General Oliver P. Smith, to begin a fighting retreat back towards the coast. The next day, the 5th and 7th Marines attacked from their positions near Yudam-ni, on the west bank of the reservoir, with some success against the Peoples Liberation Army (PLA) forces in the area. Over the next three days the 1st Marine Division successfully defended their positions at Yudam-ni and Hagaru-ri against massive Chinese human wave assaults. ​On November 29th, Smith contacted Colonel “Chesty” Puller, commanding the 1st Marine Regiment, at Koto-ri and asked him to assemble a task force to re-open the road from there to Hagaru-ri. 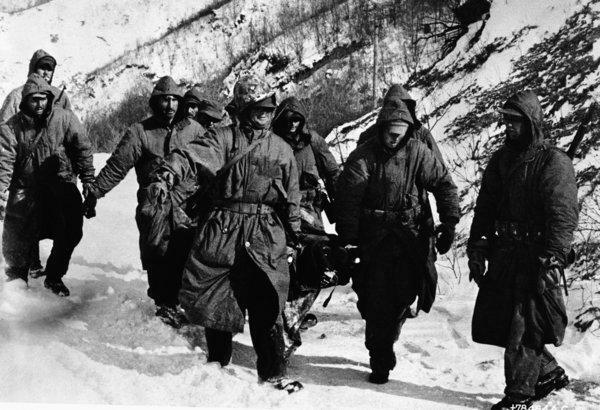 The battle was fought over some of the roughest terrain during some of the harshest winter weather conditions of the Korean War. The road had been created by cutting through the hilly terrain of Korea, with very steep climbs and drops. Huge peaks, such as the Funchilin Pass and the Toktong Pass, overlook the entire length of the road. The road's quality was poor, and in some places was reduced to a one lane gravel trail. 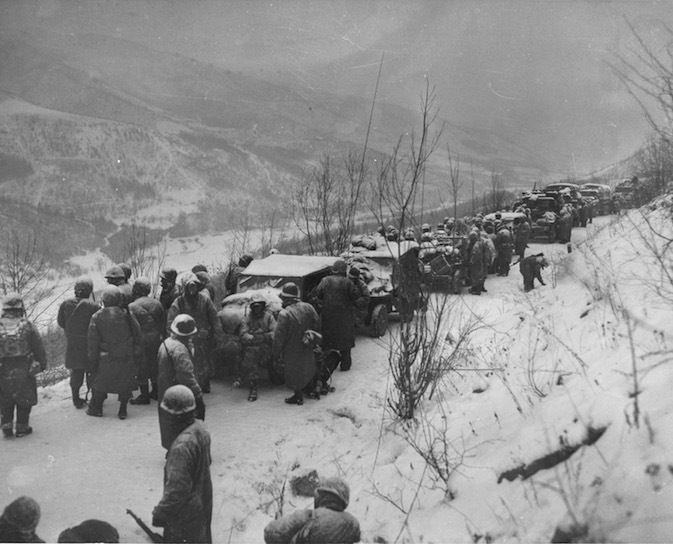 The bitter cold was accompanied by frozen ground, creating considerable danger of frostbite casualties, icy roads, and weapon malfunctions. Medical supplies froze; morphine syrettes had to be defrosted in a medic's mouth before they could be injected; frozen blood plasma was useless on the battlefield. Colonel Puller formed a force consisting of Lieutenant Colonel Douglas B. Drysdale's 41 Independent Commando (Royal Marines Battalion), G Company (1st Marines, Wedemeyer’s Unit), B Company (31st Infantry), and other rear echelon troops. Numbering 900 men, the 140-vehicle task force departed at 9:30 AM on the 29th, with Drysdale in command. Pushing up the road to Hargaru-ri, the task force became bogged down after being ambushed by Chinese troops. The cold took a stunning and brutal toll. Even cutting off clothing to deal with wounds risked gangrene and frostbite. Batteries used for the Jeeps and radios did not function properly in the temperature and quickly ran down. The lubrication in the guns gelled and rendered them useless in battle. Likewise, the springs on the firing pins would not strike hard enough to fire the round, or would jam. Fighting in an area that was later named "Hell Fire Valley," Drysdale was reinforced by tanks sent by Puller. Pressing on, Drysdale's men ran a gauntlet of fire and reached Hagaru-ri with the bulk of 41 Commando, G Company, and the tanks. Repeatedly assaulted by PLA divisions, the 3,000-man 31st Regimental Combat Team, or Task Force Faith, was worn down and overrun. Some survivors of the unit reached the Marine lines at Hagaru-ri on December 2. Holding their position at Hagaru-ri, the 5th and 7th Marines were ordered to abandon the area around Yudam-ni and link up with the rest of the division. Fighting a brutal three-day battle, the Marines entered Hagaru-ri on December 4th. Two days later, they began fighting their way back to Koto-ri. Battling overwhelming odds, the Marines and other elements of X Corps attacked continuously as they moved towards the port of Hungnam. A highlight of the campaign occurred on December 9th, when a bridge was constructed over a 1,500-ft. gorge between Koto-ri and Chinhung-ni using pre-fabricated bridge sections dropped by the US Air Force. 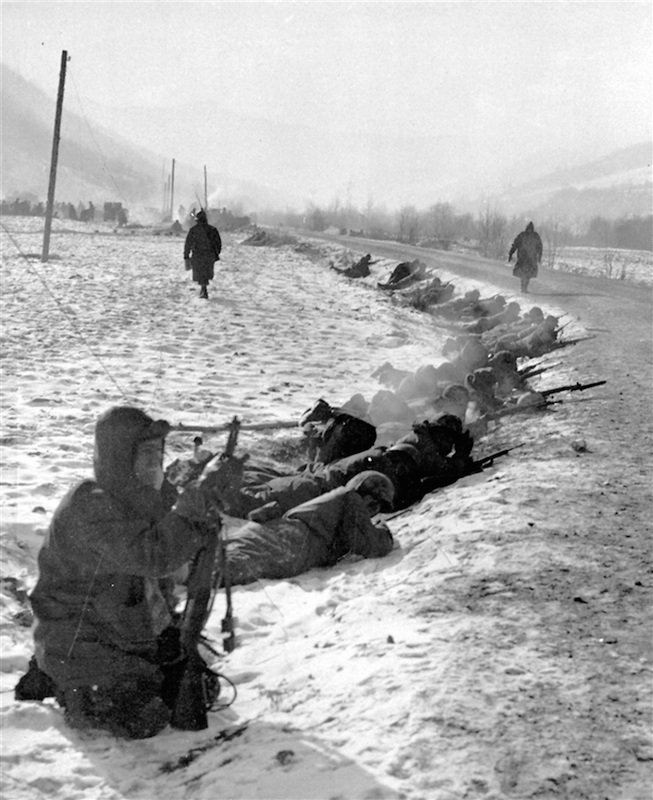 Cutting through the enemy, the last of the "Frozen Chosin" reached Hungnam on December 11th. While not a victory, the withdrawal from the Chosin Reservoir is revered as a high point in the history of the U.S. Marine Corps. In the fighting, the Marines and other U.N. troops effectively destroyed or crippled seven Chinese divisions which attempted to block their progress. Marine losses in the campaign numbered 836 killed and 12,000 wounded. Most of the latter were frostbite injuries inflicted by the severe cold and winter weather. U.S. Army losses numbered around 2,000 killed and 1,000 wounded. Precise casualties for the Chinese are not known but are estimated at 35,000 killed. 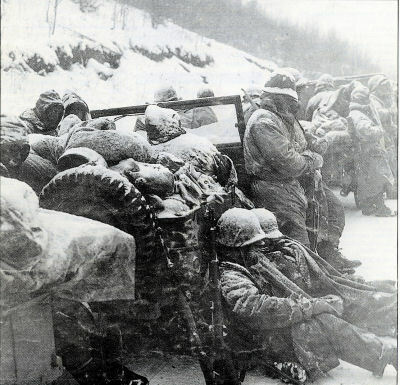 Upon reaching Hungnam, the veterans of Chosin Reservoir were evacuated as part of the large amphibious operation to rescue U.N. troops from northeastern Korea. Bud Wedemeyer was wounded from gunfire while fighting at Hagru on December 1st in his left shoulder, both legs, and he also suffered severe frostbite on both feet and hands at Yudam-Ni and Hagaru-ri. According to his son AEW, III, Bud was at Yudami when he and two other Marines were sent to Hagru for supplies. While on the road, the Chinese launched a fierce attack and Bud was wounded. Gangrene developed in his right leg, which was almost amputated, but thankfully saved after multiple surgeries. Bud was flow out of North Korea on December 5th, 1950 first to Japan, and then to Travis Air Force Base in Farifield. He was hospitalized at Oak Knoll Naval Hospital in Oakland, and later on Mare Island. 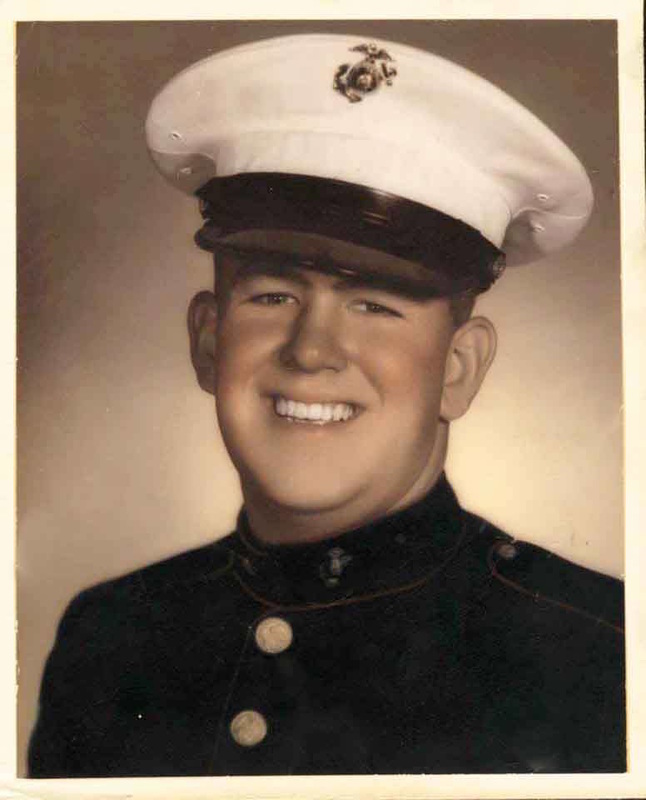 Bud was honorably discharged from the Marine Corps on May 31st, 1954, at the rank of Staff Sergeant. He had received the Purple Heart with two stars for wounds to his legs and shoulder. He also received the Presidential Unit Citation with two stars for the battle of Chosin Reservoir, the United Nations Medal for service in Korea, the National Defense Medal, the Combat Action Ribbon, and the Korean Service Medal. The long-term effects of his injuries included having Osteomyelitis in both of his legs. Following the numerous surgeries to save his right leg, he would walk for the rest of his life with a limp. He was also unable to extend his arm all the way up due to the gunshot wounds. The frostbite injuries would cause severe circulation problems in both feet by the time he was 62 years old, at which point he was classified as totally disabled. 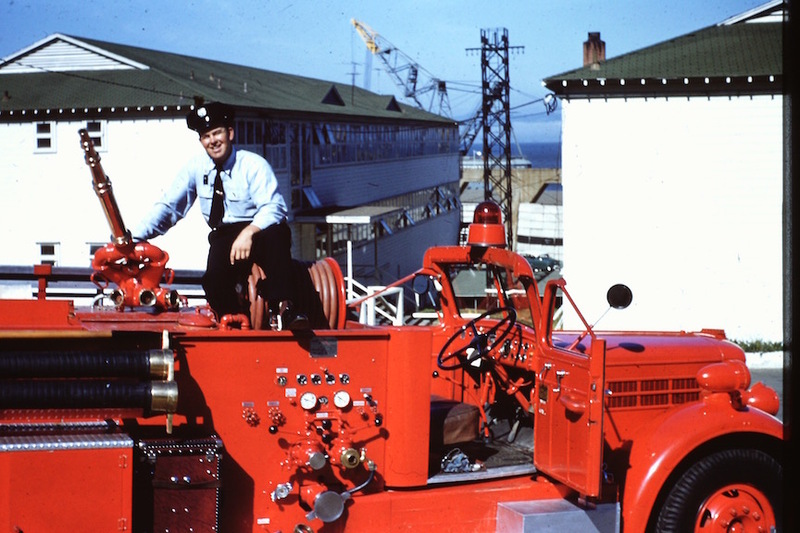 After leaving the Marine Corps, Bud made his living working as a fireman at the Tiburon Naval Net Depot, then at Treasure Island Naval Base, and then at the Larkspur FD from 1961-1968. On his days off he worked for Nelson Fire Equipment in Marin County. He remained a Volunteer Fireman for Larkspur until 1973. The Marine Corps was looking for a place to collect toys for the toys for tots program in the 1950's, and, according to Larkspur Association of Volunteer Firefighters Life Member Dale Eubanks, "Bud was a major player in establishing the Toys for Tots barrels in fire stations in Marin County." He remembered Bud and the Marines coming to a monthly meeting at Larkspur FD to pitch the Toys for Tots drive. His son Arthur E. Wedemeyer, III would later become a proud member of the Kentfield Fire Protection District as a Volunteer Firefighter. Excerpt from Bud's Obituary, July 6, 2000. 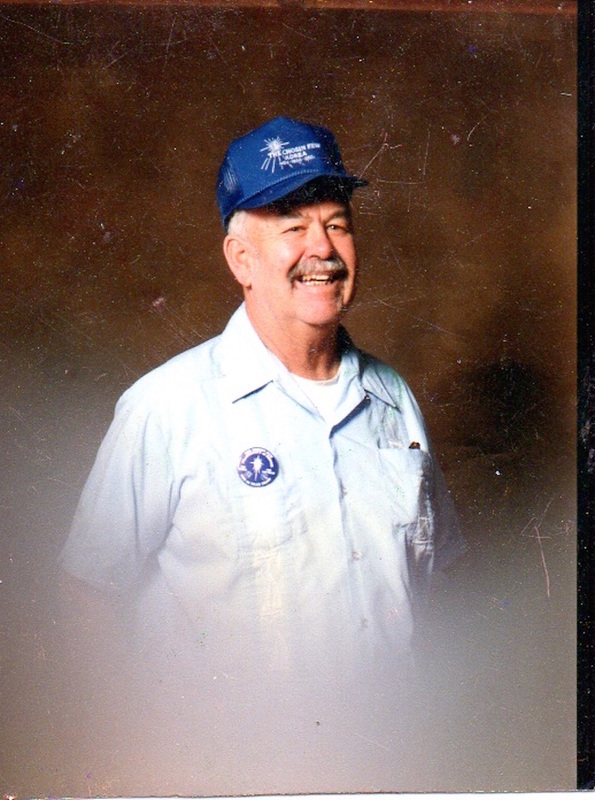 WEDEMEYER, Jr., Arthur E. "Bud" Passed away in Petaluma, CA., dearly beloved husband of Mary Ann Wedemeyer of Petaluma. Loving father of Eleanore F. Wedemeyer, Arthur E. Wedemeyer III, Juliana Wedemeyer, and Nancy A. Wedemeyer all of Petaluma. Adored grandfather of Sonja A. Rathe of Petaluma. Brother of Elaine Davis of Grass Valley and Patricia Oates of Lakeport. Beloved son of Florence Kofoed of Grass Valley. Also survived by numerous nieces and nephews. A native of Santa Monica, CA. age 70 years. A member of the Corte Madera Lions Club, Adobe Lions Club, Veterans of Foreign Wars Post #72 of San Rafael, The Chosin Few and the Larkspur Volunteer Fire Department. Footnote: The research on the Battle of Chosin Reservoir included various web sites and publications of the U.S. Marines and Navy, along with various pages on Wikipedia related to the war. The author has attempted to summarize the battle in a very short space, and fully realizes the description does not begin to do it justice. For that the reader can consult the many books and films that have been published, including the release in 2010 of "Chosin: A Documentary Film by Brian Iglesias". ​Also see the public domain film on the battle below, produced by the U.S. Navy. 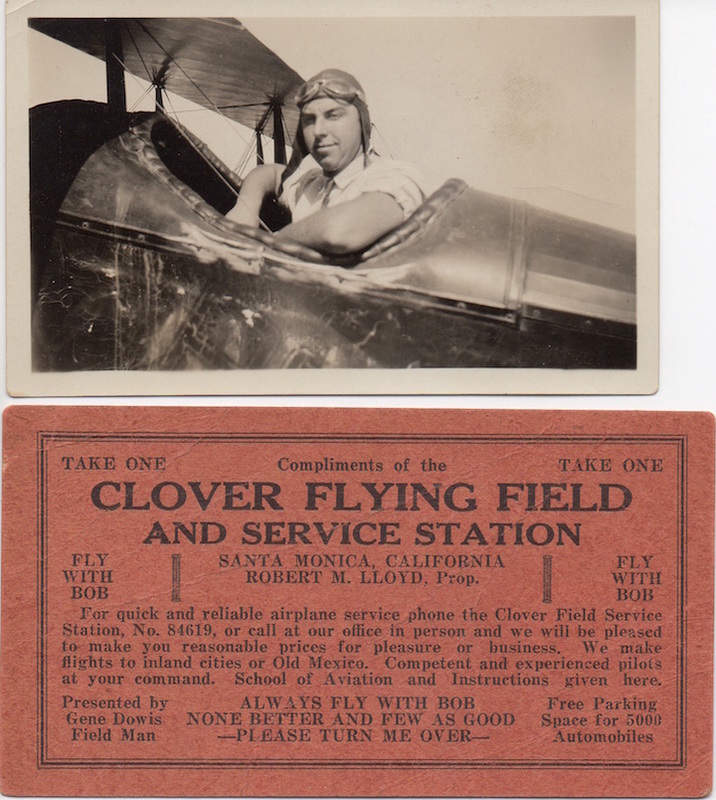 Arthur E. Wedemeyer, Sr. was a stunt pilot in Santa Monica at Clover Field. A Marines Corps Reserves meeting in the Quonset Hut at College of Marin in 1949. Bud is at the far left. The Marine Corps Landing at Inchon. 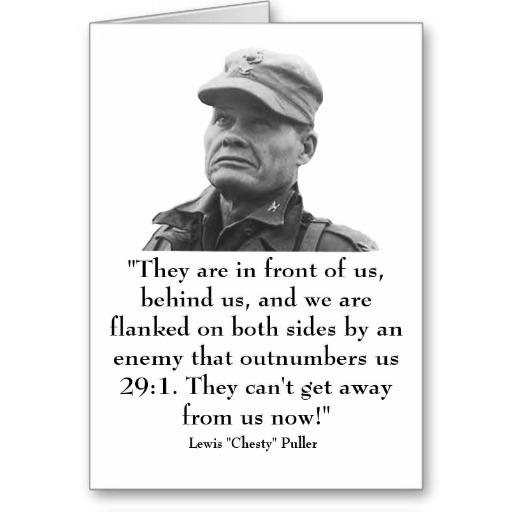 Colonel “Chesty” Puller, commanding the 1st Marine Regiment. 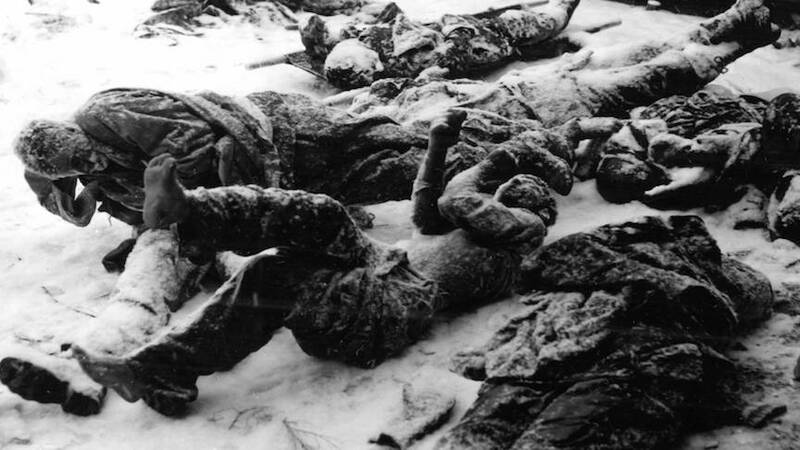 Dead bodies of soldiers were frozen in position where they had fallen. 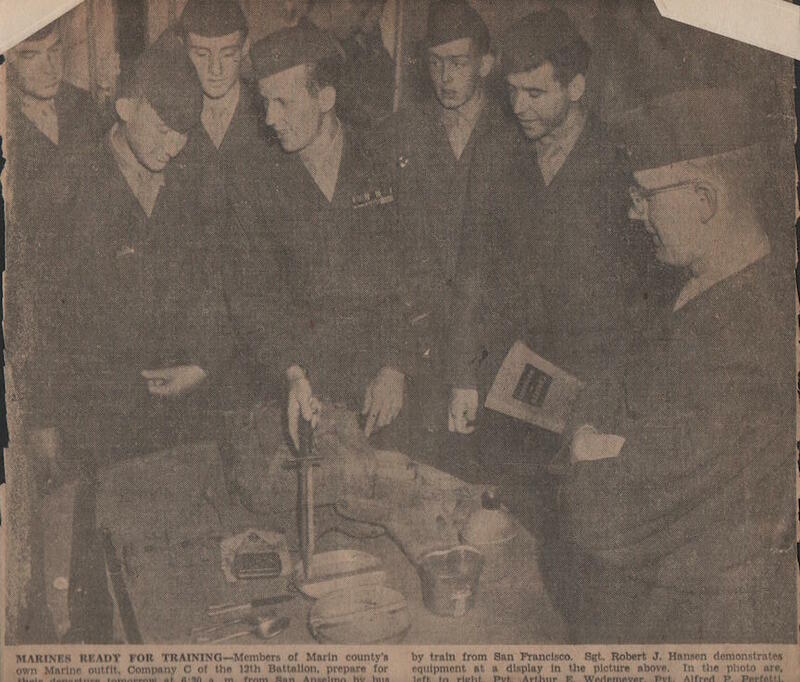 Maj. General Noble visited Bud in the Mare Island Naval Base Hospital in Vallejo. 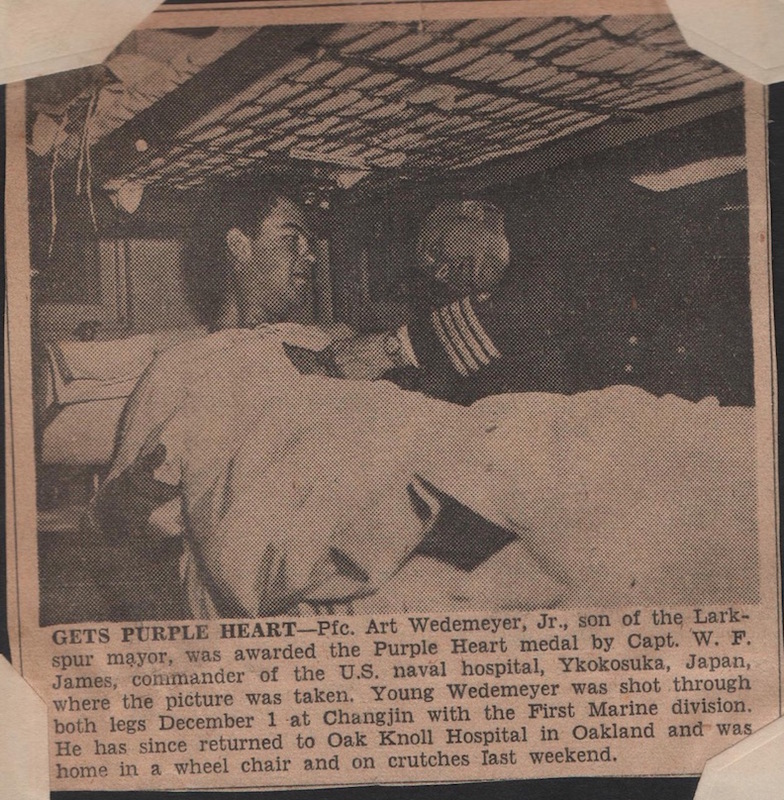 Bud received the Purple Heart while in the hospital in Japan, before being flown out to America. Bud worked as a Fireman and Acting Captain at Treasure Island Naval Base in the 1950's. He is pictured here using early breathing apparatus. Bud worked as a fireman at the Naval Net Depot in Tiburon, now the Romberg Center. Below - U.S. Navy Film on the Battle of Chosin Reservoir. Click play, then Click on symbol next to Vimeo for full screen. Public Domain.